The optional Kinetrol I/P Controller is mounted in place of the standard diaphragm housing on the side of the positioner case. The positioner can still be mounted in any orientation and gives an angular output position which is proportional to the input current control signal between 4-20mA. The 4-20mA signal is converted to an air pressure by a coil and magnet and flapper valve arrangement. This air pressure controls the positioner in the normal way. Zero and range adjustment is done within the positioner in the same way as with a standard pneumatic positioner. No adjustment is necessary within the I/P Controller. The cover is removed only to connect the two wires - this is not necessary with the DIN plug option. 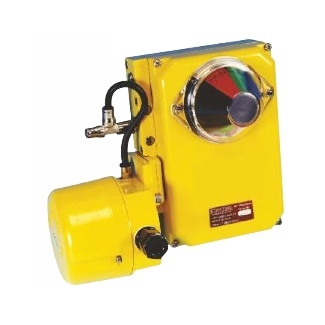 Kinetrol offers various optional I/P converters which are explosion proof or intrinsically safe certified for use in ATEX Zones 1 & 2 or NEC and CSA CLASS I DIVISION 1. They are mounted directly onto Kinetrol AP positioners with integral air supply.